9" Abdominal binders are made with elastic and a soft material to provide comfort and flexibility. Measurement based upon circumference at the hips. Tris-panel design helps reduce rolling. 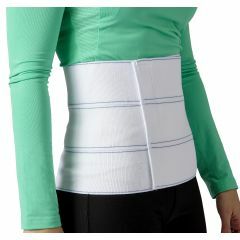 AllegroMedical.com presents The Tri-Panel Abdominal Binders. 9" Abdominal binders are made with elastic and a soft material to provide comfort and flexibility. Measurement based upon circumference at the hips. Tris-panel design helps reduce rolling. Not made with natural rubber latex.